Osmosis is a type of diffusion that, in biology, is usually related to cells. Diffusion is when molecules or atoms move from an area of high concentration to an area of low concentration. Osmosis is when a substance crosses a semipermeable membrane in order to balance the concentrations of another substance. In biology, this is usually when a solvent such as water flows into or out of a cell depending on the concentration of a solute such as salt. Osmosis happens spontaneously and without any energy on the part of the cell. Osmosis deals with chemical solutions. Solutions have two parts, a solvent and a solute. When solute dissolves in a solvent, the end product is called a solution. Salt water is an example of a solution; salt is the solute, and water is the solvent. 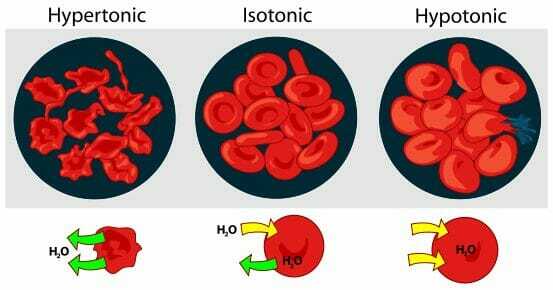 In biology, there are three different types of solutions that cells can be in: isotonic, hypotonic, and hypertonic. Different types of solutions have different impacts on cells due to osmosis. An isotonic solution has the same concentration of solutes both inside and outside the cell. For example, a cell with the same concentration of salt inside it as in the surrounding water/fluid would be said to be in an isotonic solution. Under these conditions, there is no net movement of solvent; in this case, the amount of water entering and exiting the cell’s membrane is equal. In a hypotonic solution, there is a higher concentration of solutes inside the cell than outside the cell. When this occurs, more solvent will enter the cell than leave it to balance out the concentration of solute. A hypertonic solution is the opposite of a hypotonic solution; there is more solute outside the cell than inside it. In this type of solution, more solvent will exit the cell than enter it in order to lower the concentration of solute outside the cell. Osmosis affects plant and animal cells differently because plant and animal cells can tolerate different concentrations of water. In a hypotonic solution, an animal cell will fill with too much water and lyse, or burst open. However, plant cells need more water than animal cells, and will not burst in a hypotonic solution due to their thick cell walls; hypotonic solutions are ideal for plant cells. The optimal condition for an animal cell is to be in an isotonic solution, with an equal amount of water and solutes both inside and outside. When a plant cell is in an isotonic solution, its cells are no longer turgid and full of water, and the leaves of the plant will droop. In a hypertonic solution, water will rush out of both animal and plant cells, and the cells will shrivel (in plants, this is called plasmolyzation). This is why slugs and snails shrivel and die when salt is sprinkled onto them; water leaves their cells in order to balance the higher concentration of salt outside the cells. Osmosis is how plants are able to absorb water from soil. The roots of the plant have a higher solute concentration than the surrounding soil, so water flows into the roots. In plants, guard cells are also affected by osmosis. These are cells on the underside of leaves that open and close to allow gas exchange. When the plant’s cells are full of water, the guard cells swell and open the stomata, small holes that allow the plant to take in carbon dioxide and release oxygen. Osmosis can have adverse effects on animals such as fish. If freshwater or saltwater fish are put into water that has a different salt concentration than they are used to, they will die from having too much water enter or leave their cells. Osmosis can affect humans as well; in a person infected with cholera, bacteria overpopulate the intestines, leaving the intestines unable to absorb water. The bacteria actually reverse the flow of absorption because osmosis causes water to flow out of the intestinal cells instead of in. This causes severe dehydration and sometimes death. A milder effect of osmosis is the way fingers become pruney when placed in water for an extended period of time. They look that way as a result of being bloated from increased water flowing into the cells. Diffusion – a process by which molecules move from areas of high concentration to areas of low concentration. Osmosis is one type of diffusion. Solution – a mixture made up of two or more substances where one substance, a solute, is dissolved into another substance, a solvent. Semipermeable – also known as selectively permeable, this means that only certain substances can pass through a barrier. Cell membranes are semipermeable. Cell – the smallest unit that makes up a living organism. It includes various different parts called organelles that have functions such as storing genetic material and making proteins and energy. 1. When a cell contains a lower concentration of solute than the solvent surrounding it, that cell is said to be in what kind of solution? A is correct. When a solution has a higher concentration of solute than a cell that it surrounds, the solution is hypertonic. When a cell is in a hypertonic solution, osmosis will cause water to flow out of the cell to balance the concentration of solute on either side of the semipermeable membrane. As too much water flows out of the cell, it will shrivel. 2. Isotonic conditions are ideal for which cells? B is correct. In isotonic solutions, the net movement of water into and out of the cell is the same, which keeps an animal cell balanced and functioning normally. Plant cells fare better in hypotonic solutions where they can be filled to the max with water. 3. What happens to an animal cell in a hypotonic solution? A. There is no negligible effect, as the concentration of solute on both sides of the membrane is the same. B. Water will rush out of the cell, making it shrivel. C. Water will rush into the cell, and it will become turgid. D. Water will rush into the cell, causing it to lyse (burst). D is correct. When a cell is in a hypotonic solution, the concentration of solute in the cell is higher than the concentration of solute in the water surrounding it. Water will rush into the cell and can cause it to burst. A describes an isotonic solution, B describes a hypertonic solution, and C describes a plant cell in a hypotonic solution.